This is an attractive book - it's hard cover just feels nice in your hands and the design is simple but appealing. I was excited to get this devotional as I've heard great things about it and also already have another of her devotionals 'Jesus Calling' that my toddler loves looking at the pictures in. This one, however doesn't have pictures - the pages are themed with the bird design from the cover but there are no illustrations. This doesn't bother me at all because the content is excellent and it is a good skill for children to learn to just listen without pictures sometimes too and use their imagination. Each devotion is numbered from 1 to 150. It does have a ribbon book mark attached so you can easily mark where you are up to. 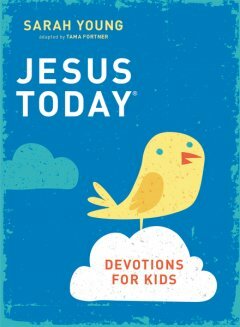 The thing that sets this devotional apart for me is that I love how it is written like the words of God directly to the child. The language is appropriate for children - I would say probably age 5 upwards or younger depending on the child's language development. Each devotional is two facing pages - on the left side is the devotional itself and on the right side are the scriptures backing up the devotional which could easily be used as memory verses too. There are also pages scattered throughout with quotes or other verses on. An example of one of these is pg 274 'We are told to let our light shine, and if it does, we won't need to tell anybody it does. Lighthouses don't fire cannons to call attention to their shining - they just shine.' D.L. Moody. While a little young for my 3 year old I'm excited to use this when the time is right. It truly is a beautiful devotional and I highly recommend it! Please note that Booklook sent me a copy of this for my review however my opinions expressed are entirely my own.